A knife thrower is one of the deadliest specialists on the field. But if you want to be one, you had better find a good place to hold your weapons. No one fears a clod who takes blades out of his pockets or pouches, or from a handful of frogs scattered around their body. 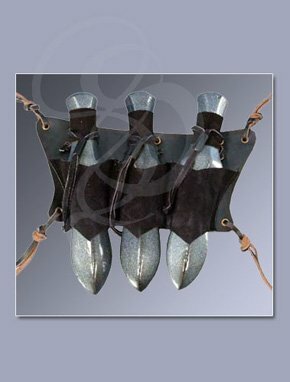 No, to capitalize on your fearsome nature you should displaying your knives proudly in this triple-slot knife holder. Made from two layers of hard and soft split-leather, this unique holder accepts three foam throwing knives. It features individual loops for each knife and leather strings for added security around the grip. You'll never lose your knives in this stylish holder. Unless you LOSE THEM IN THE SLIMY INNARDS OF YOUR LATEST VICTIM!!!! HAHAHAHAHAHAH! HAHAHAHAHAH! MUHAHAHAHAHAHAHAHAHAH!!! !